Kathy Doughty presents Friday showcase at the Guild office at 10am on Friday, 2 March 2012. The entry fee is $5 entry for members and $10 for non members. A gala day will be held as part of Yanco Agricultural High School's 90th anniversary celebrations. This will be held on Saturday 24 March, starting from 8.30am. An exhibition of quilts will be displayed in the beautiful McCaughey mansion, which now used as the administration area for the school. There will be an entry fee through the gates but no other charge to see the quilts. Yanco Agricultural High School is at 259 Euroley Road, Yanco, NSW. Quilts at Mendelson exhibition will be held at Mendelson’s of Goulburn, 160 Sloane Street, Goulburn on 10 and 11 March. The guest exhibitor will be Beth Miller. Entry is by gold coin donation, with proceeds going to Anglicare’s Emergency Accommodation program. 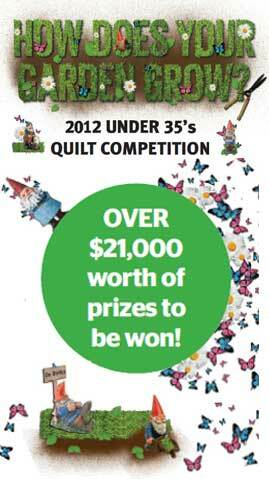 The Quilt and Craft Spectacular will be held at All Saints’ Cathedral, Church Street, Bathurst on 2 and 3 March. Friday 10am - 3pm and Saturday 10am - 4pm. Entry fee is $5. All welcome! Theme - Colourful quilts - bring along yours to share! Guest Speakers - Isobel Lancashire and Kathy Doughty.